Safe handling for sensitive animals. The Mekuti Assessor Hand is the perfect tool for desensitizing touch sensitive animals and helping to assess animals 'in rescue' or general training to help close and safe handling. 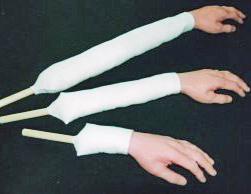 FAKE HAND – rubber hand (left only) on a dowel with padded arm. Mekuti Fake Hands are an essential tool for all Rescue Centres and animal behaviour practitioners. They are designed to give a nervous or wild animal an opportunity to learn new ways of coping with both touch and people. Our hands are constantly giving off information (e.g. heat/cold and even static) which can be sensed by the dog. The Mekuti Fake Hand is neutral. You are able to touch the animal whilst remaining in full view of them – nervous animals can react more fearfully when they feel crowded and the hand gives them the space to think and breathe. How many times have you worked with a potentially aggressive animal and worried about being bitten? With the Mekuti Assessor Hand you can be close to them and feel confident that if you do go further than they can handle the only bite marks will be in the rubber! They will pick up on your confidence and feel more comfortable with you there. You will also not be tempted to pull the hand away quickly and stimulate the chase instinct (especially in cats). Keeps both the animal and you feeling safe and confident. useful to keep in kit bag or working with small animals. for working with larger animals or particularly aggressive cases.